Why are My Patio Pavers Loose? Patio pavers are an attractive and versatile tool for landscape design. Sometimes, however, your patio pavers can come a little loose. 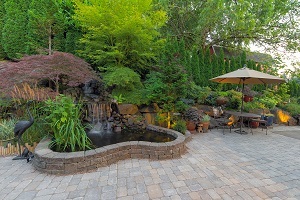 Patio pavers are an attractive and versatile tool for landscape design. They can be used for pathways, sidewalks, driveways, stairs, and all sorts of things. Stone pavers come in a variety of types, colors, sizes, and textures. They create durable hardscaping features. Sometimes, however, your patio pavers can come a little loose. There are many things that may cause patio pavers to come loose. If there is too much space between the pavers, they can become loose. As much as you may like to have each space between be the same size, sometimes pavers are irregularly shaped and don’t always fit with uniform gaps. Keeping the pavers lined up properly is important to ensure nothing comes loose unexpectedly. Another thing that can cause patio pavers to become loose is the lack of reinforcement at the edges. Because your pavers are outside, they will be subjected to all the elements, including rain, ice, extreme hot and cold, and soil erosion to name a few. If a patio paver surface starts loosening and crumbling, this almost always starts around the edges. This is because the edges of the stone are left vulnerable. Patio pavers can be edged either with wood or some type of metal before or after they are installed. Proper, strong edging is essential to the health of your patio pavers. Water is essential to just about everything on Earth. Unfortunately, it can also be damaging if the water can’t drain properly. When installing patio pavers, there should be a subtle slant to the finished surface. Even just a quarter of an inch per foot is usually enough to allow the water to roll off. The slope may not be noticeable to you or your guests, but it will cause rainwater to roll off of your patio. In the winter, this is especially important. If water sits on the stone pavers, it can seep in and when it freezes and expands, it can actually cause cracking on the surface. This entry was posted on Friday, May 18th, 2018	at 1:45 pm	and is filed under Paver Patio	. You can follow any responses to this entry through the RSS 2.0	feed. Both comments and pings are currently closed.